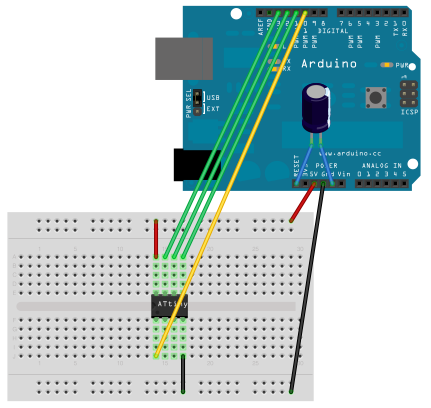 This tutorial show you how to program an ATtiny45 or ATtiny85 microcontroller using the Arduino software and hardware. The ATtiny45 and ATtiny85 are small (8-leg), cheap ($2-3) microcontrollers that are convenient for running simple programs. If you haven’t already, download the Arduino software, version 1.0.4 (1.0.3 and 1.0.1 should work too, but not 1.0.2). Install the Arduino software, following the instructions for Windowsor for Mac OS X.
Download the ATiny master.zip file from the link below. Copy the “attiny” folder (not the attiny-master folder) from the unzipped ATtiny master.zip to the “hardware” folder. You should end up with folder structure like Documents > Arduino > hardware > attiny that contains the file boards.txt and another folder calledvariants.